Following the Web Accelerator debacle, Google wants another crack at your entire internet traffic. This time, its through the Google Secure Access client. 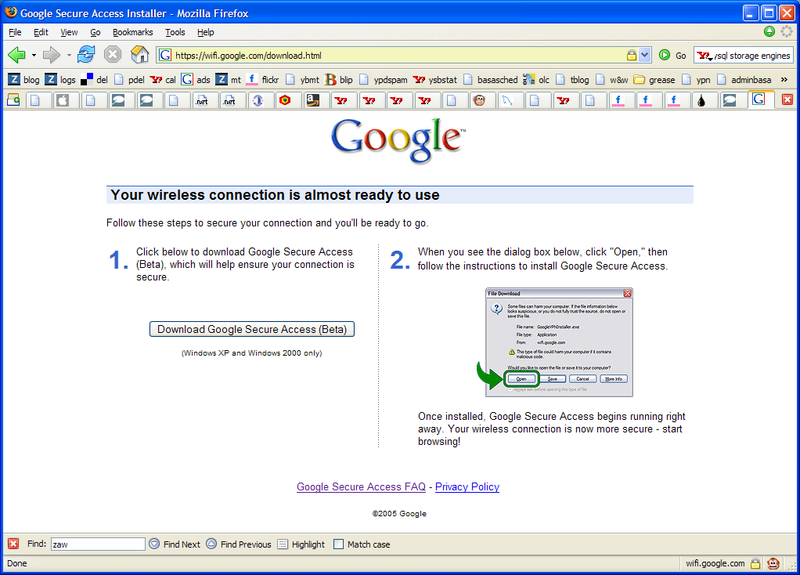 Located at wifi.google.com, GSA connects you to a Google-run Virtual Private Network. Your internet traffic becomes encryptedwhen you send it out, decrypted by Google, the requested data downloaded by Google, encrypted and sent to you, and decrypted on your maching. This has the effect of protecting your traffic data from others who may want to access it. GSA's FAQ describes it as a Google engineer's 20% project. Google Secure Access is a new product that is only available at certain locations in the San Francisco Bay Area. We are constantly working to improve this product. A regional test deployment. Add this to the GoogleNet bids and you've got some interesting afoot at the Circle K, huh? Give me a break, you put your trust in your own ISP every single day you use the web. Unless EVERY thing you do on the internet is SSL start to finish your putting your "trust" in the hands of multiple people every connection you make. Its currently 16 hops from me to this blog, Thats 16 seperate points of "trust". Give it a rest please. If the data is that important use SSL or your own VPN, otherwise what google is doing is great for the average WIFI user. I imagine that this is targeted at folks sitting at the first hop. They connect up via Google's VPN because they don't have a VPN to use. You're absolutely right that it's far better to establish your own point of trust rather than rely on others, particularly for sensitive communications, but since this is doing nothing more than guarding your WiFi connection from local snooping, you're effectively protecting your communications from the hacker at the next table. For me, this is another "meh" thing. I've got several VPNs and SSH proxies I can use at any point. I don't need Google to do this for me. Likewise, this isn't a market differentiator since it's trivial for any company to do this too. oops... looks like this is resolving to http://www.google.com now. I noticed that as well (wifi. * resolving to the main page) and wondered if it's regional traffic management in effect -- I'm on the east coast. "some interesting afoot at the Circle K"
I believe the quote you were looking for is, "Strange things are afoot at the Circle K"
"Give me a break, you put your trust in your own ISP every single day you use the web. Unless EVERY thing you do on the internet is SSL start to finish your putting your "trust" in the hands of multiple people every connection you make." The difference is that my ISP is a cable company. My employer's ISP is a major telecom. They are inthe business of providing telecom services. Google is a advertising company. Its goal is to sell targeted ads to the most specific audiences possible. You sound like one of the Slashbots that actually enjoy Google Ads for some reason. If you want your habits to be available to a company that sells advertising based on its analysis of who you are, who you know and where you are, (And sells that information) good for you. I'm on the east coast and I'm not re-directed to the homepage. At any rate, very interesting, indeed. Does anyone know how this was found, and by who? interesting...a low-cost way for google to capture the wireless zeitgeist and give the appearance of entering a new market. google has succeeded in fooling the market into thinking this is free wifi. nicely done, more of a pr coup than anything. Whatdya mean, "following the Web Accelerator debacle?" GWA is far from a dead product. Even though the beta was pulled unceremoniously, it's still very much alive. It was dormant for weeks, but then I started getting regular version updates. It's now working much better than when first installed -- it's active all the time, across NATs -- and it's (allegedly) saved me 21.8 hours so far across 83293 web pages served. Google's still investing in GWA, and I'll bet it's a key part of an architectural earthquake -- a Googlequake, if you will -- that will shift the balance of power in the tech and media worlds. According to Filemon, the Google Secure Access client is reading the Internet Explorer cookie set by the Google website. There is free and more trustworthy software available: At http://www.iopus.com/ipig you can download a free VPN client software (called "iPig") _AND_ the iPig server, so you can set up your own (Wifi) VPN in a few minutes. Worked very well for me! I wouldn't say Google trust would be an issue. I doubt they would sell or share your information with third-parties, because they use contextual-based advertising to deliver ad services to users. Besides, Google is a trusted company...just like many other large corporations. PayPal has more personal information on me than Google does. PayPal know who and how I do business online. I would think monopolizing the internet is probably a larger issue. Google will soon know everyone move and what they do, are they getting closer to the government for a reason?? With GoogleVPN they know how you surf the web, with Google Desktop they know what's on your computer, with Google Maps they know where you live (and can view your house from satellite and get directions to your front door). It's a conspiracy theory and a bit of paranoia but who really knows?? Google could one day control all activity on the internet and PC's. On the whole Google-as-big-brother topic, can anyone tell me whether the GUID in Google's cookies is actually unique to a browser installation, or just randomly (re)generated on a visit? So if you delete your cookies, as most of the tinfoil-hat sites seem to recommend, are you actually doing anything constructive, or does your next Google cookie pick up where the old one left off? I've been wondering this for a while, and noone seems to know, despite the fact that I would say it's a very important question. By experimenting, I can tell it's a different number each time, but that could be modified by the time, which is also passed in the cookie (so the transform would be reversible).